Docker container is an open source software development platform. Its main benefit is to package applications in “containers,” allowing them to be portable among any system. Docker as another form of virtualization. Virtual Machines (VM) allow a piece of hardware to be split up into different VMs – or virtualized — so that the hardware power can be shared among different users and appear as separate servers or machines. 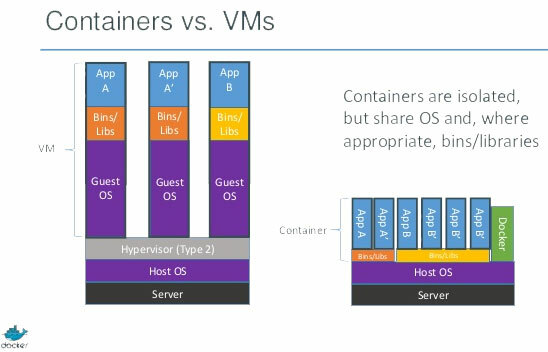 Docker containers virtualize the OS, splitting it up into virtualized compartments to run container applications. Docker is an open source software development platform. Docker containers virtualize the OS, splitting it up into virtualized compartments to run applications. Docker is the secret weapon of developers and IT ops teams everywhere, allowing them to build, ship, test, and deploy apps automatically, securely, and portable with no surprises. Docker is the secret weapon of developers and IT ops teams everywhere, allowing them to build, ship, test, and deploy apps automatically, securely, and portably with no surprises. Gopalakrishnan S on May 16, 2017. Gopalakrishnan S on May 13, 2017.